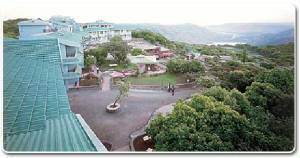 Ramsukh Resort is located at Kshetra (old) Mahabaleshwar, only 6 km. 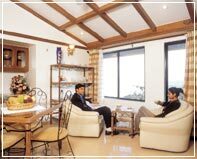 from Mahabaleshwar Market, spread over 3 acres with 52 apartments and 2 super deluxe suites. Unique Apartments with breathtaking views of Krishna valley, Kates Points, Connaught Peak, Wilson Point, Kamalgadh, Backwater of Dhom Dam & Mahabaleshwar’s Panchganga temple, an altitude of 4700 ft. above the sea level! The only location one of its kind location in Mahabaleshwar makes Ramsukh Resort the most ideal venue for conference, seminars, marriages & holiday destinations. Ramsukh Resort is well equipped with Conference Hall to accommodate 150 people in auditorium style & 50 people in “U” shape with appropriate modern infrastructure & professional manpower to assist any corporate events. The scenic location & lush green lawns accommodate 200 guests for marriages and anniversaries with complete marriage, event management package! 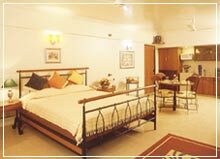 The Resort offers various (all inclusive) holiday packages in season and off season with comforts of home & convenience of Resort by state of art, Health Club , Swimming Pool with a huge deck, Games Room, Discotheque & Amphitheater. Single bedroom apartment for small family, double bed apartments for groups & big families. Two exclusive super deluxe suites with picturesque view of valley and ultimate luxury of attached steam and Jacuzzi. Décor and ambience just right for memorable experience to go down memory lane for a honeymooning couple. A well equipped modern kitchen to serve Rajasthani, Gujrati, Punjabi, Maharashtrian, Chinese & Continental Cuisine of guest choice.